Here you can find all the news about the life of these pages. Reached the goal of the 6000 online brochures! Now we work to reach 7000 !. I've published the years 1987-1998 of HP Journal in the magazine section. We published the year 1985 of HP Journal in the magazine section. I signal the release of the second edition in English of the beautiful Lucio's book about the NeXT world. We published the year 1984 of HP Journal in the magazine section. We published the years 1982 and 1983 of HP Journal in the magazine section. The publication of the the Creative Computing has been completed. RSS feeder is no more updated. We continue to publish things, but we are a bit discouraged. There is very little traffic on the site, the surveys have revealed a total failure, the blog is not interested in anyone, in short, we have no feedback on what to do and where to go. Maybe it's time to stop and think. We are uploading a lot of magazines, specifically HP Journal and Compute! Gazzette. New manuals, magazines and brochures! Keep track with our RSS. We have prepared a page to manage fun survey, just to know how we are. Finally Lucio's book on the NeXT world has arrived, here you can find my comment and here the page to book it. New manuals, brochures and magazine scans every day! With the new RSS feeder, you receive notification of the news on your mobile phone. We publish something new every day! To keep track of all the news we have created an file, so you can quickly see what's new! Started a new page on facebook. There's a really nice interview with Wozniack on the exit of the Apple //c, you can find here. Find all articles in the "Articles from magazines"
Published the photos of Brusaporto 2017, if you have photos of the event you can write me. Published a new batch of magazines "Personal Computer News"
New articles published and a new blog post. We've added the ability to put your comments on each computer, so you can tell us something if you want. Now is online the forum. They are raising funds to make a documentary on one of the most dramatic moments in the brief history of computer science, Steve Jobs's dismissal from Apple. Do you want to join? Go check out our new blog look. New articles ! We are currently translating the site into Japanese for our friends from the Land of the Rising Sun. We've added another 1.000 brochures! We're now over 5.300! Now you can also upload your profile picture from your My collection page in the top-right menu. We've come up with a brand new ranking system to pay tribute to our contributors! We are currently renovating the site to celebrate its 20th birthday. If you happen to find bugs or broken links, please report them right away. Work in progress, there will be big news. We are working to totally renovate the site. Wow 4380 brochures online ! In support Magazines/Articles, under Bit magazine, there are the articles about the Picocomputer. Fixed the download problem of the android app, now should work. Gianni, Gianni, Gianni ... questa me la devi proprio spiegare. Un abbraccio. What 'was your first Mac? 3,000 online brochures. The biggest vintage brochures collection ! Thanks to all the collaborators ! We participated in Brusaporto Retrocomputing 2013. We have reached 10,000,000 of visitors ! Mostra espositiva quarta edizione dal 5 al 25 marzo 2013. We participated in Brusaporto Retrocomputing 2012. Retro1000.BiT for Android, read more here. BYTE reprinted the May 1977 article written by Steve Wozniak giving the full (remarkable) details of the Apple II system design. Available here. Hello Jack, thanks for everything. 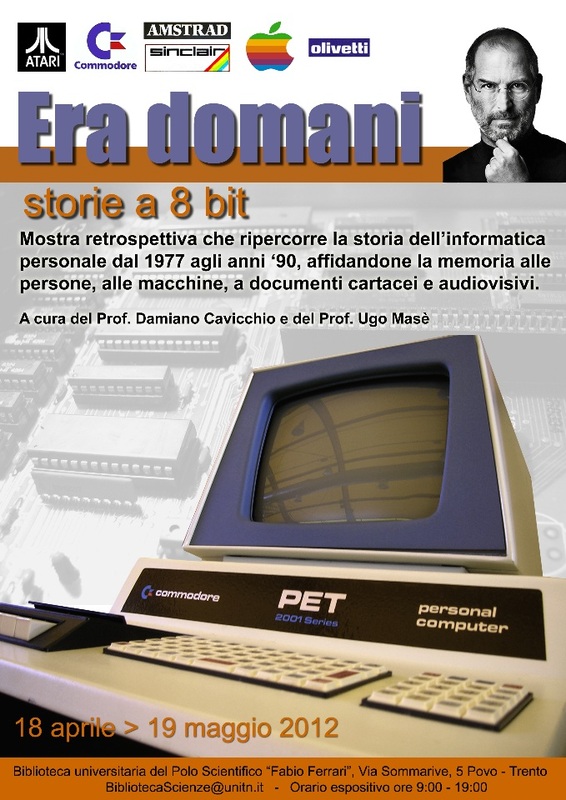 ERA DOMANI storie a 8 bit. The exhibition traces the history of computing through to the computers themselves, the promotional material, printed and audiovisual documentation. Thanks Steve for what you gave us. For its 10th anniversary the Alchimie - the alternative computing french show - will present arcade games in free access! The Alchimie 111111 will be held from Friday 11th to Sunday 13th November 2011 at Espace Rochegude in the city Tain l'hermitage. It will be a meeting place for both computing experts and beginners. We've added a new feature to the site, now it's possible to exchange messages between registered users. The new feature is available starting from the page dedicated to the collection, under the list of machines available and most wanted you can find the link : "Send an email to this user"
If you have any problems please report to the webmaster, please. 2,000 online brochures. The biggest vintage brochures collection ! Thanks to all the collaborators ! A special thank to the omnipresent friend Mark Brennan. System down resolved, sorry for the delays. Our old brochures collection is getting bigger every day. I'd like to thank you Mark Grieshaber for the SGI section, and also the "usual" Mark Brennan. More than 1,300 online brochures. The biggest vintage brochures collection ! Thanks to all the collaborators ! We have consolidated the site on a single server: www.1000bit.it, update your bookmark ! A new bunch of cool brochures has been published. Thanks to Mark. New page for cataloged videos by manufacturer. Video !!! We have started collecting videos published on YuoTube. No more only pictures !! For example take a look on the Altair now. Show to everybody yout old computer! From the "My collection" page you can now publish the pictures of all your computers collection. Directly from the seventies, a new lot of HP and TI calculators brochures. One brochure is dedicated to the historical comparison RPN vs SOA. We have over than thousand brochures online ! Thanks to Mark Brennan for the precious collaboration. Published new articles, a 1978 HP's magazine and some new brochures. New brochures published, Apollo and NCR. Added new brochures, manuals and magazines. We have reached 5,000,000 of visitors ! Thanks to Bernd Ulmann of www.vaxman.de we have published some magazines from DEC. Published a new brochures lot ! Thanks to the help of our users we have added about ten new manuals. Some technical issues has been solved, we are back online again ! How to select a hobbyst microcomputer... december 1976 ! Migration to the new server completed. Someone has used one of our email address as sender of spam mail, we're very sorry, but we assure you that we do our best to keep in secure your email address and that spamming is against our policy. We have reached 3,000,000 of visitors !!! Published the manual "Linguaggio BASIC" of the Olivetti M20, check the Documentation section. The October 8, 2006 in Spresiano (TV) - Italy, we have a vintage computer meeting. A lot of new brochures are online ! Thanks to Mark Brennan for the precious collaboration. Published the manual "Guida all'installazione e all'uso" of the Olivetti M20, check the Documentation section. Published a lot of new brochures. Published a preview about Apple /// appeared on Bit in 1980. Sorry is in italian. A great job made by Alberto Cavalcoli. We have reached the 2,000,000 visitors !!! In the events section you can find the photos about the last Vicenza Retrocomputing 2006 and some pictures about Mac In Show. My friend Juan Villa from Spain is finally online www.mundocaos.com with his impressive collection. Published the manual Olivetti M10 - Operations Guide. See in Documentation section. Published the manuals Apple II - Super Serial Card and Apple II - Parallel Interface Card. See in Documentation section. I have opened a new section, the library. I have the need to catalog all the manuals and books that I have. The November 27, 2005 in Spresiano (TV) - Italy, we have a vintage computer meeting. We have reached the 1,000,000 visitors !!! Published the article about the test of the ZX80 appeared on the number 13 of Bit, december 1980. The pictures about Varese Retrocomputing 2005 are online here. The pictures about VCF Europe 2005 are online here, thanks to Alberto Cavalcoli. We have reached the 500.000 visitors !!! Published a new article: "An Interview: The Macintosh Design Team", check in the articles section. New pictures from Alberto Cavalcoli about the last VI2005. The pictures about the last VI2005 are online in the events section. Just published, the historical Byte's article about the Apple Macintosh, see in the articles section. The schematic diagrams of SGS Nanocomputer are online. More magazines, this time the first numbers of Applicando, an italian magazines dedicated to the Apple II and Macintosh family. Thanks to an important donation, we have restored the first historic Bit's number, thanks to friend Daniele Cecconi. We have reached the 300.000 visitors !!! A new article, how to repair the Zx Spectrum's keyboard (in italian only). We added a new function on the "Documentation" page, now it's possible to select the new published manuals. Some pictures of "Tolla in festa 2004". Added some new manuals, among them the Nanocomputer's manual. Thanks to an important donation, we have restored the first historic Microcomputer's number, thanks to friend Daniele Cecconi. We have reached the 200.000 visitors !!! Added more pictures about VCFI. The first Vintage Computer Festival Italia the 4-5 September 2004 in Desenzano del Garda. The July 11 2004 in Spresiano (TV) we have a vintage computer meeting. Added new manuals, check in Documentation section. Publiched two new articles, look in articles section. We will be in Munich (Germany) the next 1-2-May for the Vintage Computer Festival Europa. We hope to meet someone of you. We have reached the 100.000 visitors !!! Varese Retrocomputing 2004 - 23 May. Other infos here. Vintage Computer Festival Europe 5.0 - 1-2 May. Other infos here. An interesting article about Paul Lutus, but it's in italian only. A new page exposing all the adverts collected so far. We have now a forum in which you can write your questions about our Web Service or you can put your suggestions, hints or samples. A new feature really important! Thanks to the use of a new technology (Web Service) our database is open to everyone, read more here. We have added a new page that show the computers by countries. A new page to aid to know which is the most common computer. New super light look, for fast fast fast navigation. We have done: 1000 data sheets! An italian clone of the Apple //e, really nice: Asem AM 64e. We have now 900 computer's data sheets!!! Apple /// schematics are online here. We have reached 400 manuals online!! We have added an AntiSpam function in the Trade section. Now your eMail address is hide in the html code. We have now 800 computer's data sheets!!! Added new models and picture under Sharp. We had some problem with our server. We are remained unconnected for 24 hours. Added in database Oki (BMC) computers with pictures. The Grundy New Brain AD has joined the collection. There are more than 700 data sheet in database, thanks to everybody. I have added a new page to show all the "boot screen" together. Oric 1 has joined us. Do you have seen the Ti 99/4's (yes not 4A) brochure ? New manuals about Univac 1103A, check "Support - Documentation". The original Apple LIsa's brochure online. We have reached the 1000 pictures !!! I have putted online the advertising video of the Apple Lisa. I have added manuals for the Northstar Horizon. Varese Retrocomputing 2003, look at the pictures. A Cambridge Z88 has joined my collection. New articles in the Articles section, take a look! New front pages in "Magazines" section. I have added a new statistic about the computer most wanted by users. Check the section "Database - most visited and most wanted"
Added new manuals in the Support - Documentation section. To read SOL Inside story written by Lee Falsenstein. Updated "Magazines" section with new front page images. Video of a working Apple I !! New entry, Macintosh Color Classic. On monday 01/13/2003, this site close at this url. I hope to reopen very soon at a new url. We have 70 online collections! From USA a Tandy MC10. Finally I have got a Commodore SX64! New entries: Enterprise 128, Philips VG-5000. An italian event about vintage computer: Vicenza Retrocomputing III Edition. Many new brochures published, thanks to Mr. Giorgio Morocutti. To put your collection online is easier than ever! New function with multiple selection per manufacturer. Big news! Manage online your own collection!. Olivetti Prodest 128s, Apple IIGS ROM03. Mac SE30, Sinclair QL, Ti-74 Basicalc. Acorn Archimedes A310, PS/2 8590. I have published the ZX Spectrum +3's pictures, the Next's brochures in italian. Finally it's arrived! Sinclair Spectrum +3. New entries: Schneider Euro PC, Hp 9845B. Next Cube has joined my computers collection. New brochure Texas Instruments SR-52. Published the pictures of my Apple IIGS Woz Edition. Three new calculators: Ti59, Ti 74 Basicalc and HP19C. Pictures of Apple IIc Plus and the CBM 4032 are online. New Olivetti brochures are online in the proper section. New pictures about VCFe, by Alberto Cavalcoli. Collection new entry: Apple IIc Plus. VCFe 2.0 pictures are on line, go to the "Events" page. New picture on C116 and Lisa 2. New pictures on Apple History and Men pages. Apple IIGS Woz Limited Edition. The new entry is: Commodore 116. Published a new Sinclair QL brochure. I have prepared a page showing all the computers model grouped by year. Others two Apple products Brochure. There are two new beautiful brochures about the Apple /// in the "Adverts - Brochure" section. In italian sorry. Activated "Bulletin" function for registered users. I have published the SagaFox pictures, take a look. In the "Documentation" section I have published the Apple Lisa Owner's Guide. Found an Epson HX20 with bag and 16Kb RAM expansion. Added new pictures in the History Apple section. Millenium last entries. Apple IIe, SGS Nanocomputer, Ti99/4a and Sinclair ZX81. Added two new manuals in the section "Support - Documentation", they are: "Apple IIGS Getting Started" and "Plus4 Service Manual". New machines: SagaFox and VTech Laser 500. The new entries of the week are all Philips' computers: Videopac G7400, VG8020 and NMS 8220. An important new entry, the Sirius 1. Published the CommodoreMax's manual in japanese (!). Finally arrived the Atari 800!!! Another MSX the Yamaha YIS503F. Published the pictures of TI TM990-189. Published the Hp 85's brochure, must see! The new entry is: TM-990/189, beautiful! Found an interesting machine the IBM convertible. Another VC20 has joined my collection, an Amiga 600HD and a strange Sanyo 555. I have re-published the "History" pages. A Macintosh IIsi and a Toshiba HX22 have joined my personal collection. Today is the first day of the 3beta version of "Il mio angolo". The new entries of the week are: Olivetti Quaderno and ZX Spectrum+ 128K. The newest Apple II, the Apple IIe Platinum edition is here! Finally the Atari 400 is here! The new entries of the week: Commodore VC20, Commodore 64C with the original box, Laser310 and Sharp MZ731. Today the new site is started. The new entry of the week is an Olivetti Prodest 128s. Added the article about the Apple IIc test (in italian, sorry). Big news, a SGS Nanocomputer, an Olivetti M20BC and a HP10C. An HP 85 reach his brother the Hp 85B. New entry TRS 80 Color Computer 2. Updated the italian FAQ about retrocomputing. New page dedicated to the Apple Lisa. New pictures of my CBM 8032SK. The Apple II's FAQ updated. The Apple Macintosh II test (in italian, sorry). Added the pictures of my Sharp MZ-80B.